Learn to love carrots! You get vitamin A and a host of other powerful health benefits including beautiful skin, cancer prevention and anti-aging. 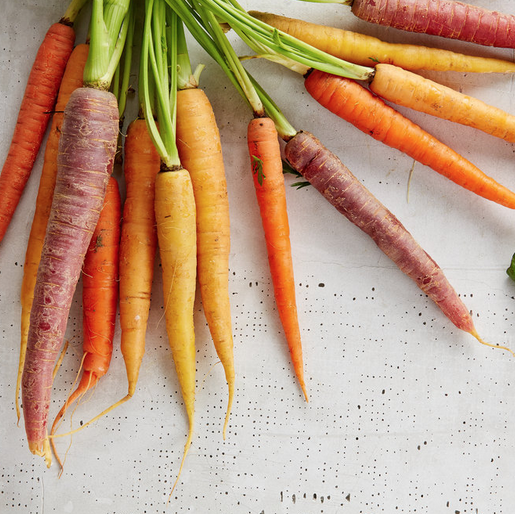 Carrots should be smooth, firm, and crisp, with deep color and fresh, green tops (if present). However, carrots that are split, wilted, have begun to sprout, or have soft spots should be avoided. Dark coloring at the crown indicates that carrots are old. Grate raw and use to make carrot cake or coleslaw. Slice into ribbons with a peeler for a salad. Slice into chunks and roast (roasts in 30-35 minutes). Put into batons and steam (5-6 minutes) or boil (5-7 minutes). Do not wash carrots until ready to use. Gently scrub carrots under cold running water to remove all the dirt on the surface. Next, trim the ends of the carrots and peel if desired. If you peel carrots, peel only one layer from the surface. If the carrots have a bad spot on them, cut it out with a small knife. Recipe created by Chef Josh Thomsen.